July 8 is the next meeting of the Democratic Platform Committee in Orlando. Even though they have failed so far, Berniecrats who want to work within the DNC structure must do everything possible to rally support for an amendment to the platform in strong opposition to the Trans-Pacific Partnership (TPP). It is about preventing the outsourcing of jobs, protecting the environment, stopping pharmaceutical companies from increasing the price of prescription drugs, preserving democracy, and respecting human rights. I believe, as Bernie does, that if we all make our voices heard between now and then, we can win this one. 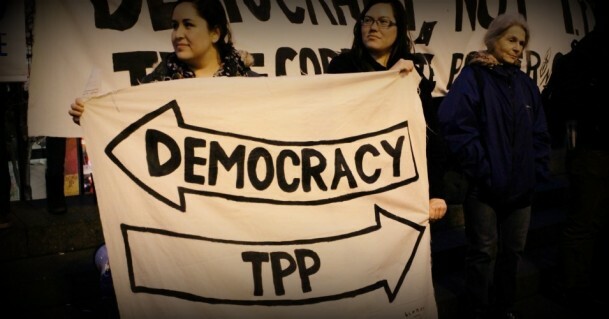 The majority of Americans and people around the world are with us on stopping the TPP. This fight on the platform is a microcosm of the same fight we’ve been in all along. It’s about millions of us making our voices heard that we need to return to a progressive Democratic Party which fights for working families and not wealthy campaign contributors. If we succeed, we will be in a very strong position to stop a vote on the TPP next winter, and to fundamentally rewrite our trade agreements to raise the living standards of people in the U.S. and throughout the world. So far, most of the specific policy measures that Bernie’s people on the platform committee have proposed have been voted down 7-6, as was any statement firmly opposing passage of the TPP. This is the case even after Secretary Clinton’s own public statement last fall reversing her original support of the trade agreement. Should she revert to her previous globalist pro-trade stance (as many have predicted she will), the lack of a platform statement against doing so lends a façade of legitimate authority to do that. In addition to leaving out any anti-TPP statement, it is disappointing that the moderates on the committee clearly prefer giving vague general statements of philosophy over offering specific, detailed policy blueprints. Such an approach threatens real implementation of any policy, and progressives have good reason to be concerned. What has happened to the party of FDR, of JFK, of the civil rights movement? When did degeneration of the spine infect our legislators? How and why could progressives have let it happen without so much as a whimper, and why do Americans accept such a low level of service from our public officials? Most importantly, what kind of message are we sending to the millions of young people who are new to the process of civic engagement? This is the work of political revolution at this moment. If we continue to stand together and fight for the values we share, progressives can transform the Democratic Party. It may not be too late, but that depends on bringing the entire party together and speaking with one voice in opposition to important measures such as the TPP. Members must prevent the TPP from ever coming up for a vote. This platform has to be the most progressive in the history of the Democratic Party. It has to be more than a piece of paper given lip service and then relegated to the round file as soon as the convention is over. It has to include a set of policies that will be fought for and implemented by elected officials. We need to see bold action, such as that evidenced by the House members who sat in on the floor of the House last week in protest over a lack of action on gun control. Some of that spirit needs to be in evidence in the formation of this party platform. Otherwise, the Democratic Party will be another step farther down the road from being the party of “yes we can” to being the party of “no we can’t”. If the Democratic Party makes a strong, clear statement that stopping The Trans-Pacific Partnership is a priority for all members, it will go a long way toward reclaiming the values that created the middle class in this country and made “the American dream” achievable for so many. It will be saying that it still sees itself as the party of the people and that it stands by those values. Without such a statement, I believe the current mass exodus of voters from Democratic rolls will continue, compelling a much harder look at alternatives in the very near future. Moira MacLean started out many moons ago with a law degree from the University of Oregon, but found actual law practice didn't suit her well. Since that realization (early 90s) she has assisted students with college admissions and financial aid matters and deepened her expertise in organizational development, starting and running several nonprofit organizations in human services and community mental health. She has recently been developing a consulting practice in the field while finishing a master's degree.